Not so many things match the joy of raising a puppy. If you’ve ever done it, then you know how exciting it can get, not to mention the happiness pups bring to the whole family. But let’s face it, when she gets messy, the experience can be a little frustrating. Potty training can definitely help with that and what’s even better is that the process doesn’t have to be long, tiring, and involving or one that requires plenty of time, patience, and persistence. Dog pee pads have made things a little bit easier. Now you don’t really need to be at your home or dedicate all the attention to your little friend just to avoid those unfortunate accidents on your carpet. Instead, the pee pads will take the hit where you would have dealt with unpleasant odors and stains stuck in your rug. In fact, if used properly, the pads can greatly assist to toilet-train your pet. Nowadays, we have so many varieties designed to match the needs of your puppy as well as your expectations as a pet parent. I’ll be looking at them in detail shortly. But first, I’ll show you how to identify an option that is right for your dog. 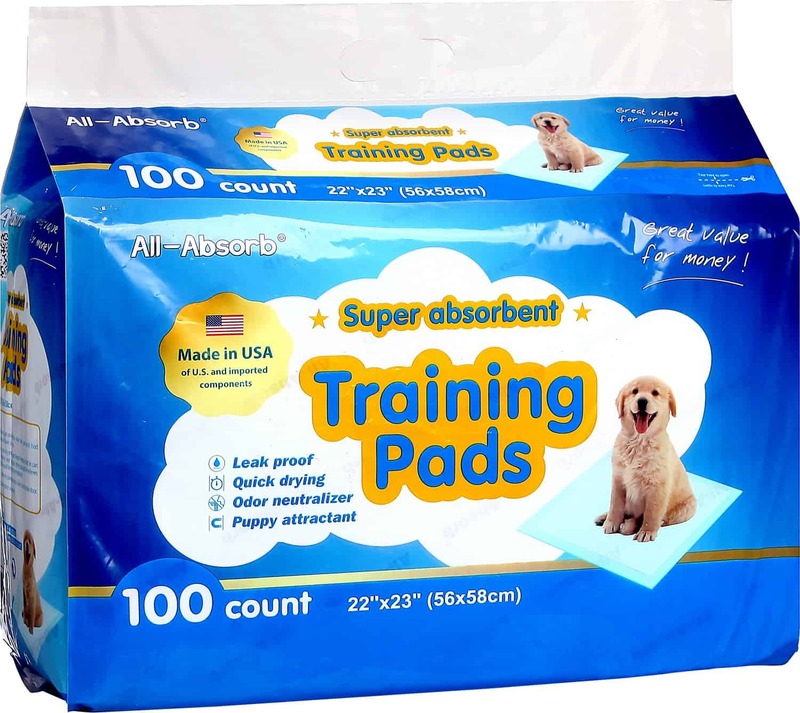 In case you’ve not made up your mind yet on whether you need pee pads for your dog, it would be great to note they are great for several situations, besides housetraining your puppy. Absorbency rate – Make sure the pad is highly absorbent. Find out how much liquid it can actually hold (a minimum of 3 cups would be great). If it’s the type that gets wet and begins to drip after one bathroom break, that’s definitely the wrong option. Resistance To Wear And Tear – Because pups tend to be playful while some are aggressive chewers, it would be great to identify a pad made from a material that is not easily destroyable. Leak-Proof – Nearly all pee pads have some form of a waterproof feature. However, some tend to be more effective than others. If possible, check out the reviews to see what other pet parents are saying. Also, consider brands that have a 100% leak-proof guarantee. Odor Neutralizer – Odor control is where the pad has a mechanism that prevents the smell of urine from spreading. Some dog urine pads tend to be better than others at this. You will also encounter some that come complete with a fragrance designed to mask those unwanted smells. Attractants – Attractants are elements that have been added to the pads to make them attractive to your pet. They include things like pheromones, ammonia and the like. Thus, your pup is more likely to move towards the pad than to your rug. Quick-Drying Surface – Look out for pads that have a quick-drying top layer as this helps to prevent things like urine-soaked paw prints. Now let’s see what makes these five options special and worth a try. 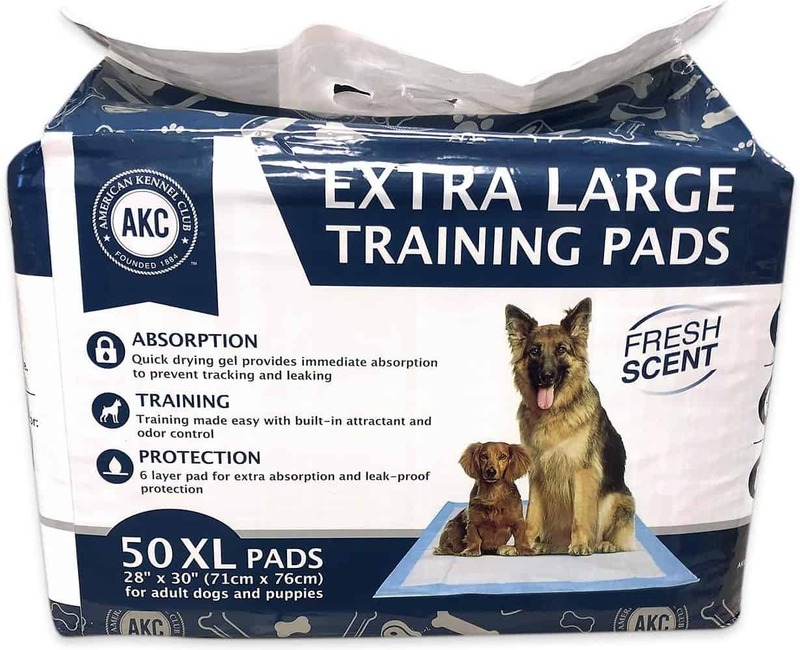 American Kennel Club Fresh Scented is the ideal pee pad that will rescue you from having to clean up your doggie's potty mess on your carpet or sofa and dealing with the resulting odor. In case you are wondering how helpful this pee pad really is, these features tell it all. For starters, this particular variety is extra-large, measuring 30 inches and 28 inches. So, you can be sure that it will be spacious enough for a pup(s) or an adult dog. Secondly, it is constructed with a 6-layer composition that has absorbent gel for superior absorption. This sort of construction is not only effective in absorbing but crucial for preventing leaking and tracking. 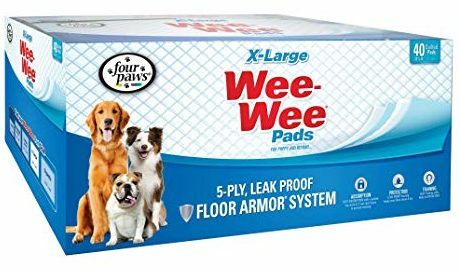 Of the many things that make the Wee-Wee Pee Pads special, the 5-ply leak-proof Floor Armor System seems to be the most loved since it allows dogs to pee as they want without messing up your rugs or seats. 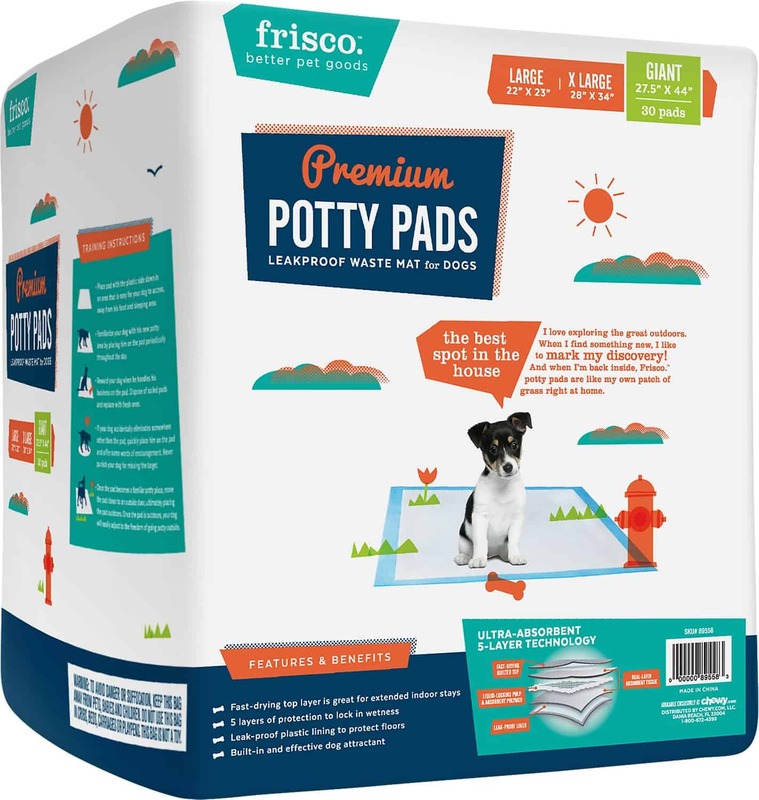 Although potty training is not rocket science, you will have an easier time doing it with the help of this pee pad because it is treated with a special additive that attracts your pooch when it's time to pee. Knowing how much pet parents loathe the stench of urine in the house, Fours Paws also equipped this pee pad with a quilted top that locks away moisture and neutralizes odor. Plus the liner is an effective floor armor that helps to keep your carpet safe. Also, the construction design of the Wee-Wee Pad makes it leak-proof and being extra-large makes it able to provide plenty of space for potty business. Top on the list of things that make Frisco Training Pads highly-rated is the fact it has been infused with an attractant that helps your pooch to get used to the pad quite quickly without belabored and lengthy trainings that leave you exhausted. And with its good retentive composition, your floor will definitely stay dry with no leakages or wet paw marks. Just remember to give your furry pal a treat during the training phase for encouragement whenever she has to pee on this pad. If you ever bought a pee pad for your dog and ended up experiencing run off and tracing, it means the construction of that product was not thorough. 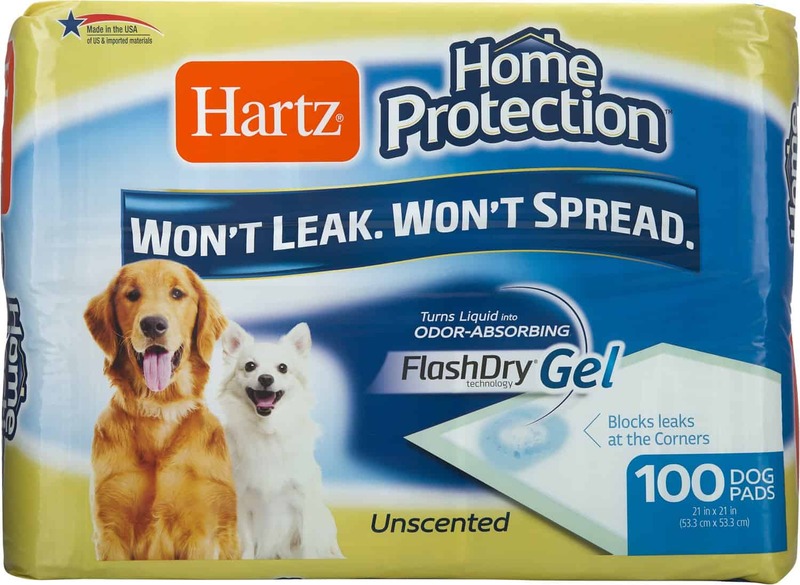 Because it was made with such an eventuality in mind, the Hartz Home Protection Gel Pads pride themselves in being pleasantly effective at absorption, thanks to the unique flash-dry technology that promptly turns urine into gel. This automatically solves issues such as runoff and wet paw marks every time your pup does his potty thing. From experience and based on what fellow parents admit, masking odor seems not to be as effective as neutralizing it. Well, this pee pad neutralizes odor, meaning the potty area will be kept as fresh as possible for longer. Also, this pee pad is versatile as it can be used for the house potty, crates, or as a car seat protector when traveling with your furry buddy. All-Absorb Training Pads boast of multiple effective features that combine to make them great at taking care of your dog’s potty mess. Like most of its close competitors, this pee pad has an attractant in them, making it ideal for potty training. You will be excited to know that the underside of the pad is 100-percent leak-proof while its 5-layer pad, which is super absorbent and highly retentive, ensures that there’s no runoff. Amongst the five layers, you will find baking soda, fluff pulp as well as a polymer core. This combination of materials ensures absorption, retention, and zero leakages. You can use this pee pad in a variety of ways, including in your pet’s crate, potty, or car seat during transportation. Also, at 22 inches by 23 inches, that’s enough surface space for your pooch to take care of her potty business. These work amazingly well if disposables are what you are looking for. However, they are not recyclable. As a pet parent, I have to admit that I find dog urine pads as a basic need for my furry friend. You could use anything else, say a rug or piece of newspaper, but then it wouldn’t be as absorbent, protective of the floor/rug, and comfortable for your dog as a pee pad would. Yet that’s not even all you will gain from a pee pad. You’ve probably identified other benefits from our reviews and guide, which means now you have more than enough reasons to give it a try. For a few dollars, you can get a pad you and your dog will live to love. Please don’t deny her this awesome item. Better still, placing your order for any of the great pee pads I’ve reviewed is as simple as clicking the buy button.